Life would not be possible without the many fundamental, life-sustaining functions of the Biological Terrain. Balance and health within this fluid environment creates life and balance within all of the cells in the body. Precise monitoring of the Biological Terrain can be essential to understanding the underlying factors that may create unhealthy imbalances as well as empower the client with the knowledge of how to create vibrant health within the cells. How is the Biological Terrain Assessed? Monitoring the Biological Terrain involves assessing the biological fluids of urine and saliva. These fluids have specific characteristics and contain certain levels of elements that are released by the cells. The Biological Terrain’s environment is important to transporting these elements to various locations and destinations throughout the body – through the blood, lymphatic fluid, saliva and urine. Measurement of specific factors within these fluids can offer a window into the biochemical functioning of the cells. With this valuable information, a proper nutrition, stress management and detoxification program can be implemented to optimize and support healthy cellular function. Bio terrain testing offers actual time presentation of your present health status. It also allows us to see changes more rapidly than the standard blood test and makes this a better tool for monitoring treatment effectiveness. Traditional Chinese medicine (T.C.M) is thousands of years old and still effectively makes use of hundreds of acupuncture points on the body to treat many conditions. These acupuncture points lay within a network of pathways called meridians where the movement of our chi (energy life force) circulates within our system. Meridians are connected to our organs and they are interconnected energetically to each other. T.C.M. practice creates a holistic view of the body’s internal relationship to its external environment and provides a system to maintain balance of both. It is within this theory if the chi and bodily fluids flow properly we can experience good health. On the other hand, when these pathways are blocked, weak or too strong, it can manifest it into array of conditions we know today. Acupuncture therapy is not only effective but can complement any other therapies being used safely and effectively. Hundreds of clinical studies on the benefits of acupuncture show that it has successfully treated conditions ranging from musculoskeletal problems, nausea, migraine headache, anxiety, depression, insomnia, infertility, Allergies, Asthma, Sinusitis, Headaches, TMJ, Back Pain, Dizziness, High Blood Pressure, Chronic Fatigue, Fibromyalgia, Addictions, Indigestion, Constipation, Sexual Dysfunction, Post-Operative Recovery. In my practice I use both traditional and modern acupuncture methods. These methods include electrical stimulations, magnets, laser, and seeds. Each can be used to stimulate the acupuncture points to balance the meridian and micro systems. These methods have limited the need of using needles rendering the therapy painless. 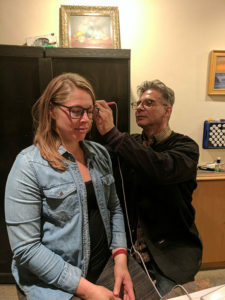 I have been Certified Master of Auricular Acupuncture, A Certified Practitioner of Korean Hand Energetics, and Trained in 8 principles Traditional Chinese Medicine, 5 Elements acupuncture, Modern Bioenergetics Acupuncture, Japanese Hara diagnostics and Reflex Therapy, Reverse Imaging model for pain treatment and electro acupuncture. I combine the use of body acupuncture points as well the hand and ear microsystems to apply acupuncture care. This allows acupuncture therapy to be done at home for better results and cost effective care. Acupuncture, electrical stimulation, lasers, cupping and moxibustion treatment are well known for treating pain effectively. Supporting treatment of underlying issues that block the healing process are also useful such as Herbs, Nutrition, homeopathy and Chinese Tuina Physical Therapy can accelerate pain relief and healing. I use Herbal therapy both eastern and western herbal medicines to balance the key functional systems Supportive and vital for daily health. Both traditional herbal formulations and customized blends are used to treat my patient’s specific needs. A healthy emotional state is critical for good health, reducing stress and optimizing our life potential. The most important consideration in treating the emotional level is to understand if the internal imbalance is the key driving force or is it the environmental influences causing the disturbances. Once that is determined we can begin supporting the imbalances with acupuncture, energetic medicine and emotional processes. Though these methods have been effectively used around the world it does not replace professional psychiatric care. These methods may be helpful completing medical care and you can discuss it with your medical physician for approval. The Chinese medical theory expresses the importance of the emotional and spiritual connection to the body. Advanced Techniques of acupuncture therapy can address the 5 spirits. Conscious mind is awareness of our experience and how we perceive it. Unconscious mind is the part of the mind that keeps our heart beating and we continue to breathe without thinking about it. The subconscious mind is where we stuff things when we don’t want to re-experience a thought or feeling. The mind takes all its experiences and perceptions then stores them as memories. These memories are then used by your mind as a reference guide. These memories construct our perceptions about life and create how we react to things and from early age. We continue to react the same way and re-creating the same experiences. These perception created and stored can be accurate, partially accurate, or totally inaccurate altogether. The problem is that these patterns are created by this process maybe the source limiting your potential, the source of your health problems or recreating the very thing we have been trying to change. Through increasing our awareness and understanding we can reframe our experiences releasing the old patterns and taking on new paradigms that open our lives and heart to greater potential. Techniques like Hypnosis, Thought Pattern Management, and Emotional Freedom Technique are effective processes. Energetic support such as Bach Flowers, Homeopathy and Gem elixirs have shown to have profound effects on this level of healing. Functional medicine principles are based on treating the underlying cause of disease. A complete metabolic assessment is used to understand biochemical pathways essential to health. I use a metabolic assessment form, neurotransmitter assessment form, Zyto Technology Analysis, Functional Blood Chemistry. Immunity (Gut, Bronchial, Brain Barriers. Active Infections, Autoimmunity, Gut Flora and Microbiome). All things in life has its own energy signature or resonance including or body and all it parts. Energetic Testing also known as Muscle Testing or Kinesiology is a method of assessment that challenges the body’s energies against environmental energies or influences. First establish a healthy strong muscle with resistance then challenging a substance while placed on the body while testing the same muscle, if the muscle weakens this means that the substance weakens the body. It can also be used to test whether a substance / remedy strengthens or corrects the body by presenting a strong muscle test. The benefits of energetic testing are it can assess things no chemistry test of either urine or blood can assess. I have years of training in many systems of energy testing including Vega Bio kinesiology, Nutritional Reflex Testing, and Morphogenic Field Testing. Energetic testing is a way to communicate with the body to uncover weakness and find the proper remedies needed to correct the body. All of us have structural imbalances whether congenital or acquired. All soft tissues, bones and muscles are all connected to all aspects of the body including the meridians, metabolism and emotions. My approach to assessing structural imbalances is to listen careful to the history of the patient, observation, palpation and energetic testing. When palpating I look for proper function and characteristics of the joints, connective tissues, strength of muscles. Chi energy and blood flow in the Meridian pathways. Meridians known as the muscle channels can be assessed by Chinese medical diagnosis for improper flow or blocked energy affecting the muscular skeletal system. Emotions can lock their way into tissues suppressing the healing, creating pain and tension until properly addressed. Toxicity impacts the structure, nervous system and creates malabsorption of proper nutrition. Malnutrition from an improper diet can keep us from getting the vital building blocks for a strong structure. Not all structural problems and pain are due to injuries many people have problems that have progressively worsened over time without recollection of an event. This means that we need to take consideration that imbalances can be due to bad postural habits, over use, metabolic imbalances, emotional imbalances or toxicity. It can be 1 or more of these factors contributing to the problem. The correct nutritional, herbal support, energetic medicine, acupuncture and body work will be very effective in most cases. I started my training studying Asian physical therapies Acupressure, Shiatsu, Thai Massage, and Chinese Tuina. I have also had training in western approaches such as Myofacial release, cranial sacral therapy and vector point therapy. I provide acupuncture treatments to address pain and structural imbalances giving you a complete integrative program for correction and pain relieve.